Welcome to Pathogen Perspectives! 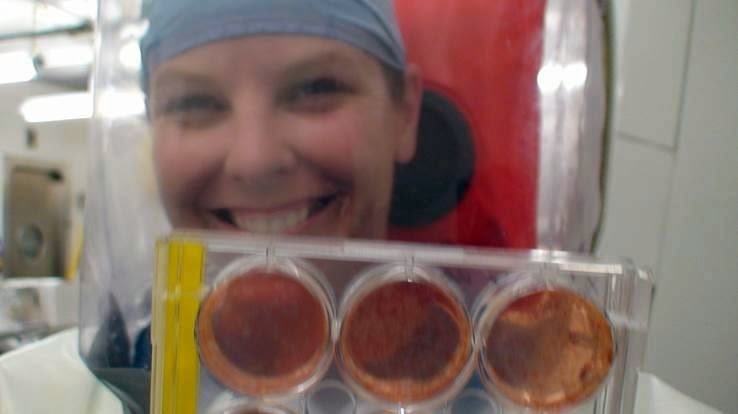 My name is Heather Lander and I have a PhD in Experimental Pathology with a concentration in arenavirus pathogenesis. I have more than 14 years of hands-on experience working in labs with viruses, with over half of that focused on the virus that causes Argentine hemorrhagic fever- Junin. Junin virus is a member of the family Arenaviridae, genus, Arenavirus and further classified within the Tacaribe serocomplex, also known as New World arenaviruses. Like Ebola, Junin is transmitted to humans from animals. I worked with the virulent strains of Junin in a BSL4 lab. I also helped other researchers in the BSL4 lab working with Rift Valley fever and Ebola viruses. 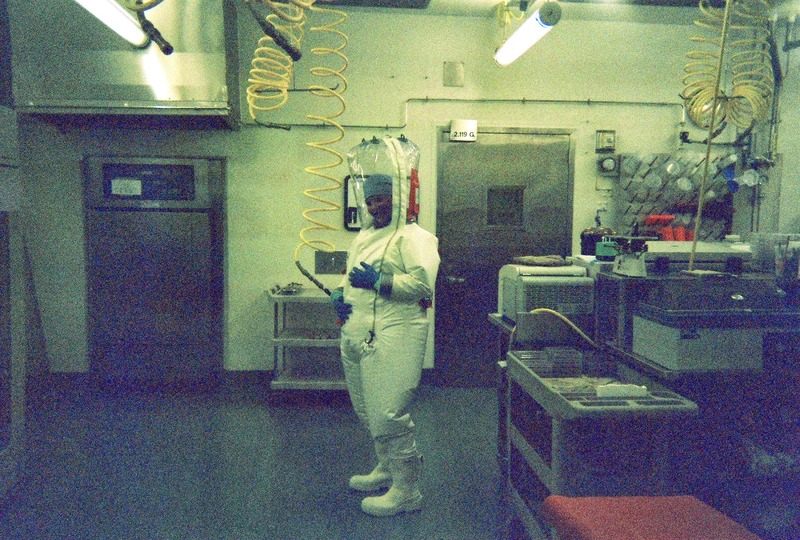 The photo above is me, 9 months pregnant in a BSL4 lab. The photo on the right is me, not pregnant, but thrilled to be holding my first successful plaque assay with the virulent Junin virus Romero strain. I am not an Ebola researcher. However, Ebola virology and epidemiology were included in my education and training, and I have the experience required to critically read and accurately interpret scientific studies on Ebola. I also have Ebola experts near me with whom I am able to speak about Ebola epidemics. There is a clear need for communicating infectious disease facts to the general public, so I decided to utilize my expertise and passion for pathogens here, where I can discuss whatever topic happens to be lurking in my frontal lobe, in the news, or on that public bathroom doorknob. And while the current matter of critical importance is the Ebola epidemic, in the future, I will be addressing all manner of emerging infectious disease topics. Hopefully I can make this small corner of science accessible and interesting, and help mitigate the unnecessary fear mongering that some infectious diseases seem to inspire. I am also now a contributing writer at Global Biodefense and The Conversation (AU) So check it out! Feel free to leave comments, ask questions, or email me at pathogenperspectives@gmail.com, but please be respectful. Hi Heather, thank you for having this blog. I have a question about ebola that I haven't seen addressed, even in your posts. Are the people who survive the infection immune to being reinfected with ebola? That blood from survivors has been used to treat infected patients implies that some degree of immunity may remain. If this is the case, then the doctors who survived may be able to resume their work without fear of contracting ebola again. What is your understanding about this? Hi Paul, Thank you so much for taking the time to read. Antibodies to Ebola have been detected in survivor's blood up to 10 years post infection, but whether those provide protection against illness remains unclear. I imagine they provide at least some protection but for how long, I don't know. I would imagine that newly recovered patients are still protected to a degree that would allow them to more safely work with patients. I think success of blood as a treatment is really not supported by the data, and while antibodies are good indicators of past infection, their efficacy at fighting the disease is unclear. Evidence suggests that they indicate a robust immune response was mounted, but that some other aspect of that response cleared the virus. We definitely need more studies on this, but it's a tough one to tackle. Thanks again for reading! Heather are the antibodies present in all humans or are they only in a select group ?